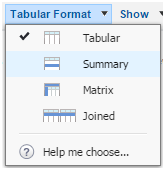 Describe the four report formats: tabular, summary, matrix, and joined. There are four report formats available for your use: Tabular, Summary, Matrix, and Joined. Tabular is the default format. Tabular reports are the simplest and fastest way to look at your data. Similar to a spreadsheet, they consist simply of an ordered set of fields in columns, with each matching record listed in a row. While easy to set up, they can't be used to create groups of data and there are limits to how you can use them in dashboards. Consequently, they're often best used for tasks like generating a mailing list. Let’s make a tabular report! In this example, we’ll want to generate a list for our Account Executive of all open opportunities above a particular amount threshold, so that she can do some outreach this afternoon. Sales use case: Review all open opportunities above a particular amount threshold. On Reports, click New Report, choose the Opportunities report type, and click Create. Select All Opportunities for Show. Select Open for Opportunity Status. Select Created Date for Date Field. Select Current FY for Range. The following columns should already be included in your report: Opportunity Name, Type, Lead Source, Amount, Expected Revenue, Close Date, Next Step, Stage, Probability (%), Fiscal Period, Age, Created Date, Opportunity Owner, Owner Role, Account Name. Click Save, name your report Open Opportunities This Year, and accept the auto-generated unique name. Depending on which org you’re using to run through this tutorial, you may or may not see data in your report at runtime. Use the Hide Details button to easily collapse records for an at-a-glance view by summarized fields. Click the Show Details button to show fields again. Matrix reports allow you to group records both by row and by column. These reports are the most time-consuming to set up, but they also provide the most detailed view of our data. Like summary reports, matrix reports can have graphs and be used in dashboards. Check out this short video on matrix reports. Now that you’re convinced, let’s build a matrix report. In this example, our CEO wants to know revenue trends, month over month. Let’s start by creating the basic report. In this step, we’ll create a matrix report showing sales by type for each month. On the Reports tab, click New Report, choose the Opportunities report type, and click Create. Select Closed Won for Opportunity Status. Select Close Date for Date Field. Select Current FY for Range. Choose the range that best fits the data you want to analyze. Click Tabular Format and change the report format to Matrix. Group the report by Type by dragging that field into the column grouping drop zone. Group the report by Close Month by dragging that field into the row grouping drop zone. Click the menu for the Amount column and select Summarize this Field. Select Sum and click Apply. Click Show and deselect Record Count, Details and Drop Zones to clean up the view. You may want to hide the report details when viewing a matrix report. Matrix reports are usually easiest to consume with details hidden. To hide the report details, click the Show link and deselect Details. Name your report Revenue Trend by Type and accept the auto-generated unique name. Joined reports let you create different views of data from multiple report types. In a joined report, data is organized in blocks. Each block acts like a “sub-report,” with its own fields, columns, sorting, and filtering. You can add a chart to a joined report. Check out this short video on joined reports. Why would you want to build a joined report? If you’ve got two reports and you want an easy way to view them side-by-side, check out joined reports. In fact, why stop at two? With joined reports, you can add up to five report blocks. To try this out, let’s build a simple tool to track how well sales reps are capitalizing on their opportunities. We’ll create a basic Opportunities report, add three blocks, filter each block by the appropriate status, and then group the results by sales rep. 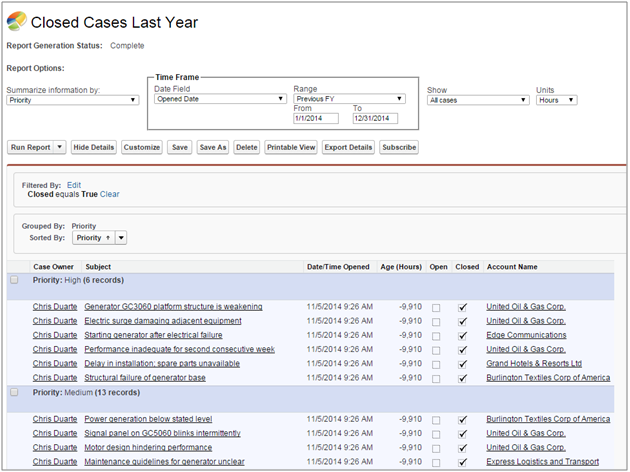 Create a new report, selecting Opportunities as the report type. Click Tabular Format and select Joined. Notice that your report data is now set off in a box with a colored border. That’s your first block. Create a new block by dragging the Opportunity Name field onto the preview pane somewhere to the right of the first block, and drag the Amount and Account Name fields onto the new block. Did you notice a second filter panel appearing in the filter pane above the blocks? Each block in our joined report has its own independent set of filters. Create a third block in the same way. Now we have three different Opportunities reports sitting next to each other in the same container. They’re all identical right now, but we’re going to use each one to tell us something unique. Remove all the fields except Opportunity Name, Amount, and Account Name, by dragging them back over to the Fields pane. That’ll help us focus on what’s important here. In the filter panel, set Show to All Opportunities. Click the dropdown at the top right of each block and make sure Record Count is checked. Click the dropdown next to Amount, click Summarize this Field, and select Sum. Now let’s configure each block to tell a different part of the story. For the fastest results, always filter as narrowly as you can. Filters that use equals will often return information more quickly than filters that use contains, does not contain, or not equal to. In complex reports, this can make a difference. Click Save, then Run Report. We’ve just created a handy resource that sales reps can use to monitor their track record and to stay on top of deals that are heating up.